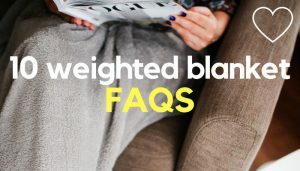 Heard abut the benefits of a weighted blanket for sleep & anxiety, but not so keen on the price tags? You should find the 3 affordable weighted blankets below are a little easier on your pocket, as they all come in at under $100. Increasingly popular of late, as an aid for both anxiety & insomnia, weighted blankets were originally designed for people with autism. But due to the way they’re made, they don’t always come cheap. Why Are Many Weighted Blankets So Expensive? Heavier than regular blankets, weighted blankets are filled with tiny plastic poly pellets or micro glass beads, which apply a gentle ‘hug’ like sensation on the user. This gentle stimulation encourages the brain to release neurotransmitters, such as serotonin, which are linked with wellbeing & sleep. To prevent slippage & evenly distribute the weight, the beads or poly pellets are stitched into pockets inside the blanket. Weighted blankets also come in different weights & sizes to accommodate the size of each individual user. These factors all contribute to the end price tag, which reflects the materials & labour required to make a good quality weighted blanket. Most weighted blankets were also originally hand or custom made (many still are) & whilst this can mean excellent quality & craftsmanship, it can also bump the price up. 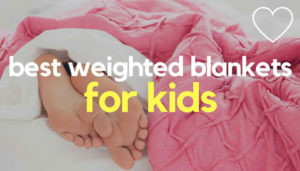 Other blankets, such as Weighted Comforts’ COOLMAX® blanket use materials aimed at specific needs – in this case hot sleepers. Again, features like this will be reflected in the price. So finding a cheap weighted blanket wasn’t always easy. But the good news is – as they’ve gained in popularity, weighted blankets are increasingly being mass produced in a range of sizes to suit both children & adults. This means there are now some much more affordable weighted blankets out there. Here are 3 of the best weighted blankets currently available for under $100. The YnM adult/kids weighted blanket is highly rated with customers, with an affordable price tag that doesn’t skimp on design or quality. 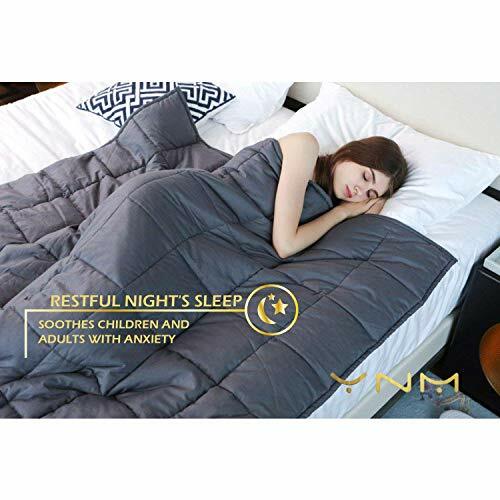 Made from 100% cotton, the YnM weighted blanket is filled with micro glass beads, which are sewn into pockets to aid even weight distribution & also limit excessive movement & noise. The blanket features a 7-layer system, which includes more beads & less fiber fill, to aid both comfort & temperature control. This is serious attention to design for the money. If you want a removable cotton or sensory minky dot duvet cover, you will have to buy this separately. 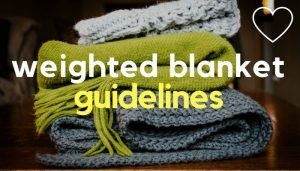 But, whilst it’s recommended, it’s not essential, as the product details state the cotton weighted blankets themselves are still machine washable/dry cleanable. This is a hard blanket to beat for design & affordability & my top pick for an affordable blanket. Available in a wide range of adult & child sizes, from 5lb upwards. YOU CAN GET A YNM ADULT OR KIDS WEIGHTED BLANKET HERE. The Good Knight Weighted Blanket is another affordable option, which consistently gets the thumbs up from contended customers with sleep & anxiety issues. Made from 100% premium cotton, the main difference with this blanket is the filling, which instead of glass beads, is tiny non-toxic, poly-pellets. These are again sewn into pockets for even weight distribution. Not sure whether to get glass beads or poly pellets? Really, it’s down to personal choice – but one of the key differences with poly pellets is the fact they’re less dense than glass beads. So they may make a good choice if you prefer a slightly bulkier blanket. Some people also find that poly pellets tend to fall to the sides of the pockets a little less than micro beads. 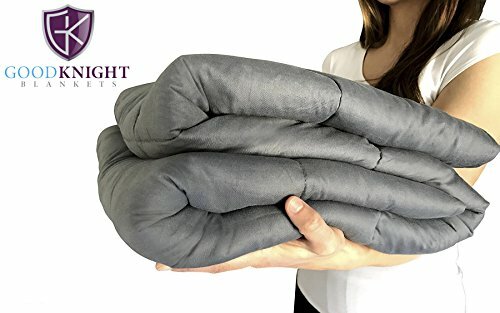 Again, the Good Knight weighted blanket doesn’t include a removable cover in the price, but the product details state the blanket itself is still washable. A cover is recommended though, to help protect the blanket & aid easier washing. Size availability is more limited, with adult 15, 17 & 20 lbs blankets currently available. But it’s a good (and popular) choice if you want a poly pellet filling over glass beads. YOU CAN GET A GOOD KNIGHT WEIGHTED BLANKET HERE. Looking to buy a weighted blanket for your child? It’s generally recommended that a child’s weighted blanket should be 10% of the body weight, plus 1-2 lbs, but . not all manufacturers make weighted blankets in child sizes. Quility do and their blankets come consistently highly rated, at a lower price than many other blankets for children. Quility blankets are made from breathable cotton & filled with micro glass beads, sewn into pockets & padded with microfibre to help prevent slippage. A big benefit of these blankets is that they come with a polyester, Minky dot cover included in the price. The washable cover is lovely & soft (and tactile!) for kids, as well as easily removable, which is handy for those hotter summer months when you need a cooler blanket. 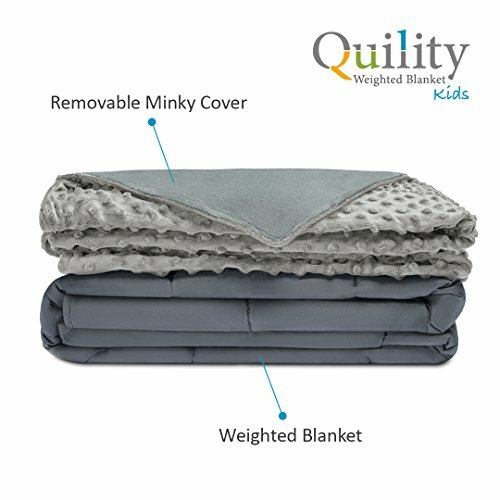 You can buy Quility weighted blankets for children in 5, 7 & 10 lb sizes. 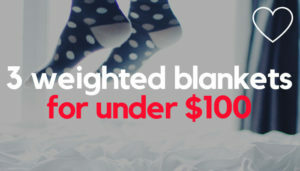 If the size you want isn’t in stock though, try YnM, who also produce some highly rated blankets for kids, but keep in mind a removable cover isn’t included in the price tag. YOU CAN GET A QUILITY KID’S WEIGHTED BLANKET HERE. 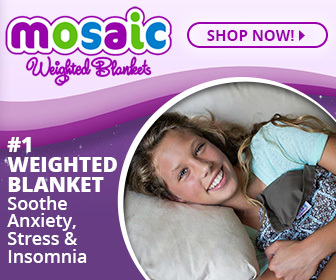 Many people have found weighted blankets a tremendous help with insomnia & sleeping issues, as well as symptoms linked with anxiety, autism, sensory processing disorders, PTSD & restless leg syndrome. But weighted blankets don’t always come cheap. 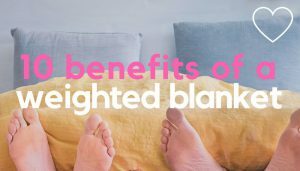 Thankfully, though, due to their increasing popularity, there are now some very well rated weighted blankets out there, which still offer you the major benefits of a weighted blanket, but at a more affordable price. Looking for more choice? 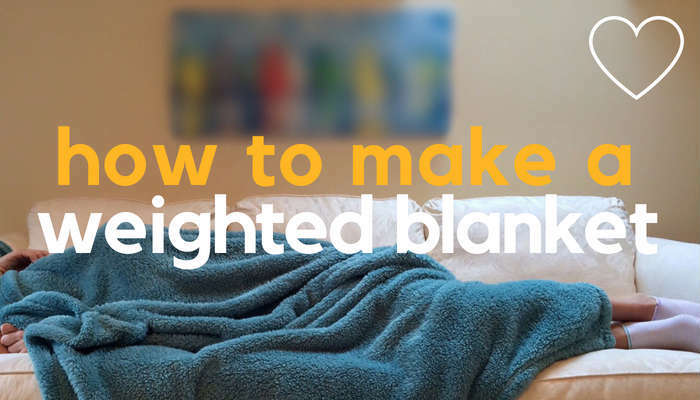 Try these 7 weighted blankets for adults or these 5 weighted blankets for kids who can’t sleep. *Please note; at the time of writing, the featured blankets were all available in an adult or child size for under $100. 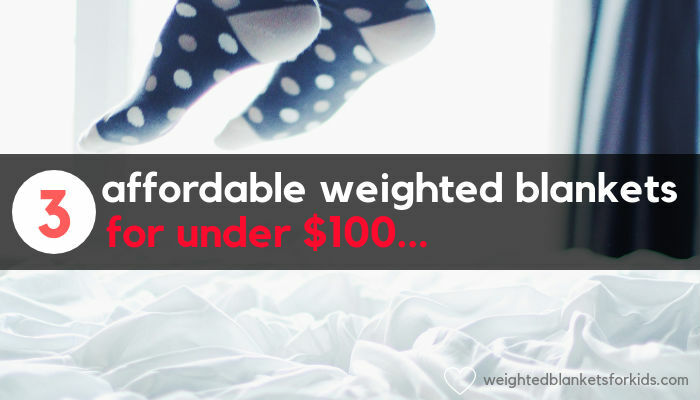 However, the price of weighted blankets may change. The price of weighted blankets is also often different in Europe, so may not convert to a same or similar price within the EU.